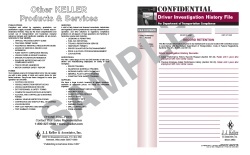 Driver investigation history information must be kept "in a secure location with controlled access.". This means a locked file cabinet or password-protected electronic data, with controlled access. Section 391.53 requires that access be limited to only those involved in the hiring decision or those who control access to the data. A motor carrier's insurer may have access to accident history info but not the alcohol and drug info. Note: All forms are single copy except where noted: (2) = 2 copies, (3) = 3 copies.